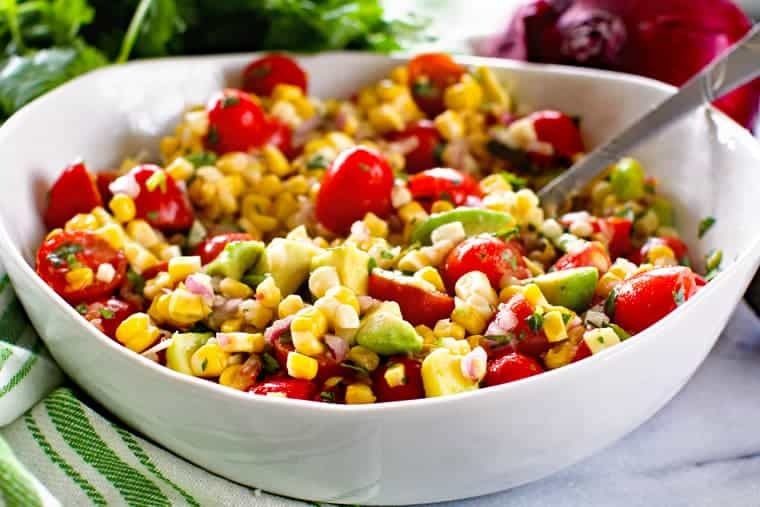 This summer salad is packed with flavor from grilled corn, fresh tomatoes, avocados, lime juice, red onion and cilantro! 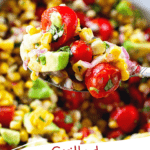 Mix up this Grilled Corn Salad recipe for your next summer party! If you eat with your eyes, you’ll definitely want to start here, don’t you agree? You’re going to absolutely love this salad! 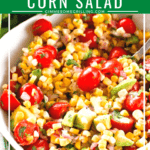 It easily pairs with everything at your summer barbecue and adds a bright fresh summer crunch from the corn and creaminess from the avocado. Does this look delicious or what? 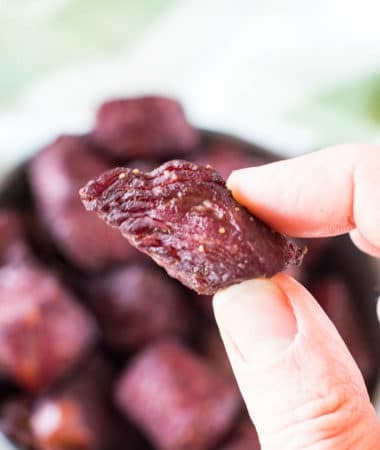 This is an easy healthy side dish and one that everyone loves! We currently have corn and tomatoes coming out of our ears over here. Our tomato plants are CRAZY. My middle child loves cherry tomatoes straight off the plant. I’m lucky if I get some because every morning she wakes up and asks to go check her tomato plants. Heavens, if she sees a red tomato from the house she’s bound and determined she is going to get it RIGHT now and there’s no changing her mind. Luckily for me, my Dad always plants a big sweet corn patch out on the farm so I’ve got that too. I just love, love, love sweet corn! 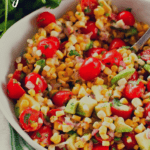 Mix that crunchy, fresh grilled sweet corn with the bursting fresh cherry tomatoes and this Grilled Corn Salad is AMAZING! The perfect summer salad for you. 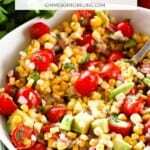 What are the ingredients for grilled corn salad? 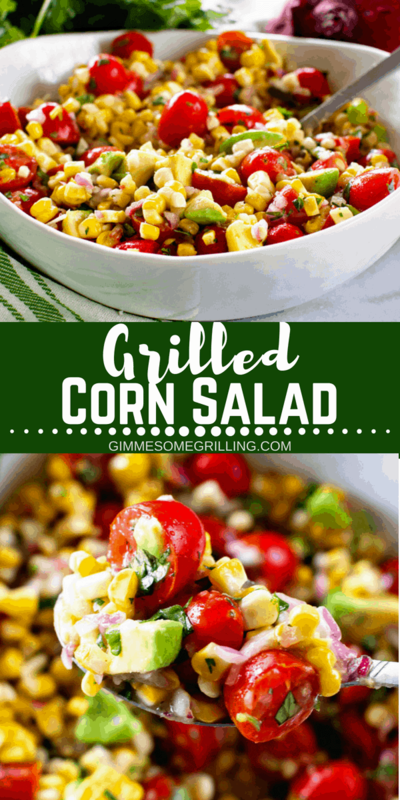 What kind of dressing goes on grilled corn salad? I use an easy homemade lime vinaigrette – all you need to do is whisk together olive oil and salt, lime juice, cumin, and pepper. It’s really that simple and it’s the great compliment for the salad. 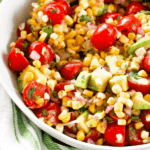 The lime brightens the flavors and goes perfectly the corn and avocado. Bonus? It keeps the avocado from turning brown also! 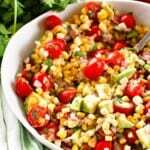 How to make corn salad? Clean grill and preheat to 350 degrees F.
Shuck the corn and brush with olive oil and season with salt. Grill until until the corn is tender and you have great grill marks, about 10-15 minutes. Turn corn occasionally. Remove the corn from grill and allow to cool. Cut the kernels from the cobs and place into large bowl. 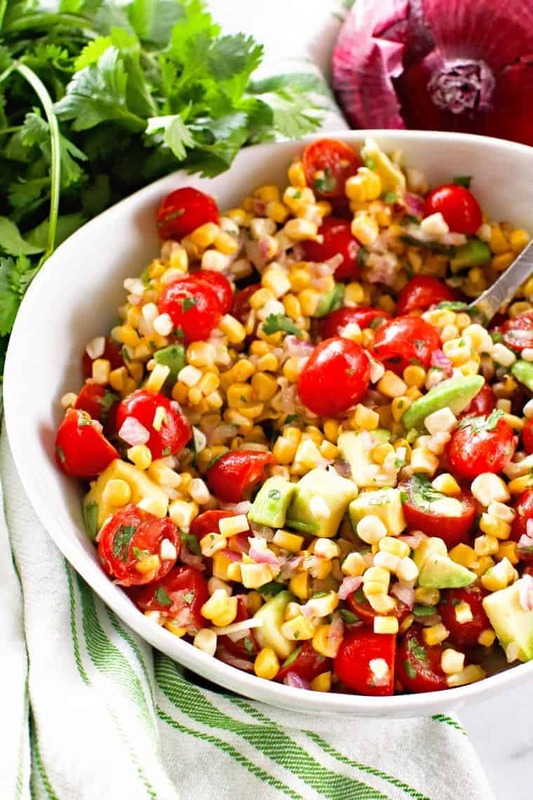 Add avocado, tomatoes, onion and cilantro to the bowl with corn. Pour dressing on top. Toss to gently combine. Serve immediately! Top off a this Best Hamburger Recipe – serve it right on top and pass the napkins! Top off your BBQ Pulled Pork Pizza – it will add bright fresh crunch! 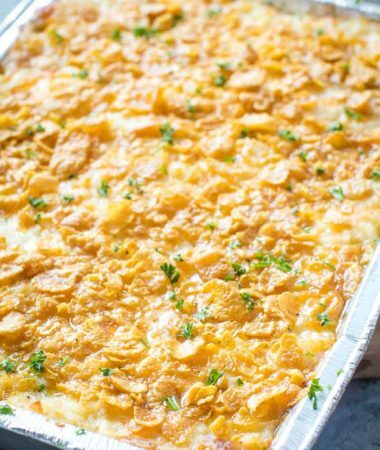 Of course it is a great side dish! 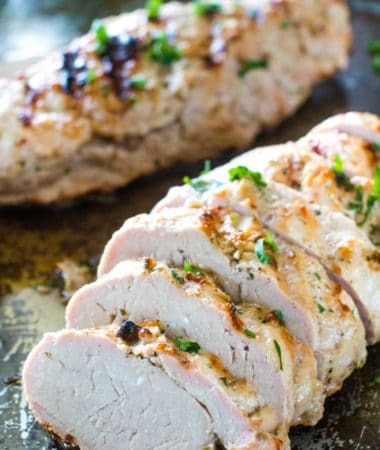 Serve it alongside Marinated Grilled Vegetable and Steak Kabobs or Southwestern Pork Chops yum!! You may want to double (or triple!) this if you’re making it for family or friends. It’s so full of great crunch and everyone loves this salad! When you make this (and I know you will!) be sure to tag me on Instagram @gimmesomegrilling or #gimmesomegrilling – so I don’t miss seeing it! 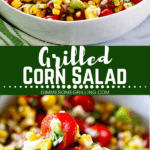 I know you’ll love this super easy grilled corn salad, I promise! Ooh! And if you have a moment, leave a comment below with a five star rating and let me know what you think of this tasty recipe! Clean grill and prepare for direct cooking over medium heat, about 350 degrees F.
Brush corn with 2 Tbsp olive oil and season with 1/2 tsp salt. Grill over direct medium heat, with lid closed, until brown spots have formed and corn is tender. This will take 10-15 minutes. Turn corn occasionally. Remove from grill and cool enough to handle. Cut the kernels from the cobs and place into large bowl. In a separate bowl whisk together the remaining olive oil and salt, lime juice, cumin, and pepper. Set dressing aside. 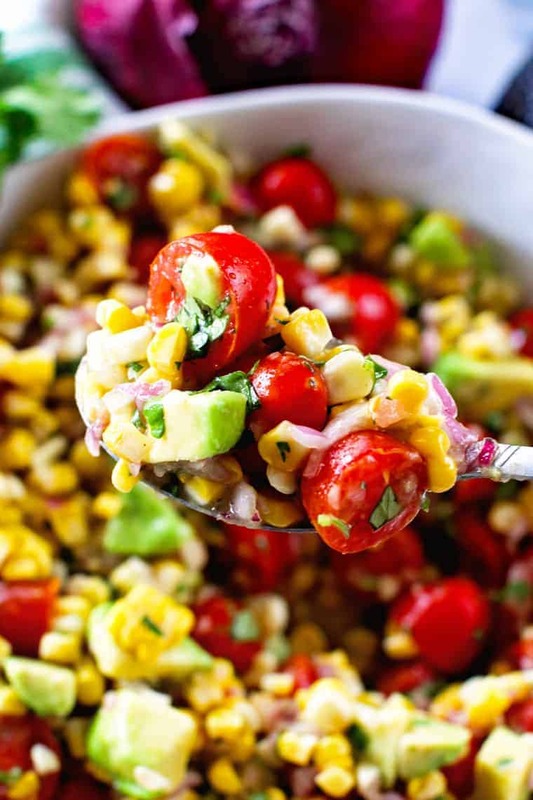 Add avocado, tomatoes, onion and cilantro to bowl with corn. Pour dressing on top. Toss to gently combine. Serve immediately.